Britain's Foreign Secretary Boris Johnson addresses the Conservative Party conference in Manchester, October 3, 2017. 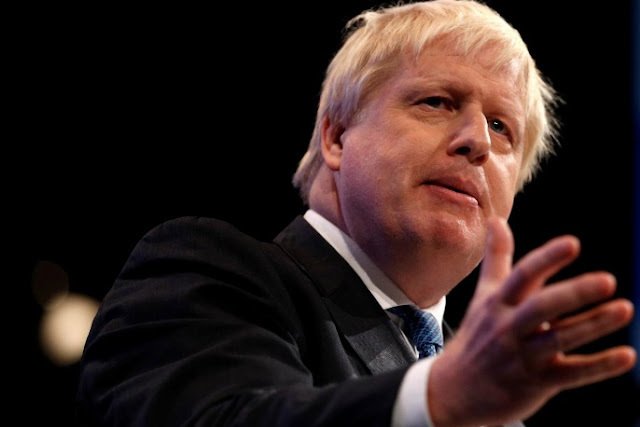 MANCHESTER, England - British Foreign Secretary Boris Johnson quipped on Tuesday that Libya can become a new Dubai if it can clear the dead bodies away, the latest gaffe by Britain’s top diplomat. Johnson, who has offended some allies with flippant remarks, told Conservative Party members that the Libyan city of Sirte could be turned into the next Dubai by British investors if they could clear the bodies. When asked about Johnson’s comments, PM May’s deputy, Damian Green, said all ministers need to be careful with their language when dealing with sensitive issues but refrained from criticizing the foreign minister. May’s appointment of Johnson, who in the run-up to Britain’s referendum on EU membership compared the goals of the European Union to those of Adolf Hitler and Napoleon, caused consternation in some European capitals. Britain’s ambassador to Myanmar was forced to interrupt Johnson earlier this year as he tried to recite a nostalgic colonial poem by Rudyard Kipling in public during a visit to the country’s most famous Buddhist site.